Hair Salon Columbia Md Tells about the 6 Top Flat Iron Mistakes And How To Avoid Them | Best Salon and Spa in Columbia MD! We love flat irons! They are an excellent way to achieve a shiny straight look, especially if you don’t want to go with a chemical straightener. Great for nearly all hair types, flat irons are the best value on your time, energy and money to achieve a super straight hairstyle. A versatile tool, flat irons can also create beautiful waves and smooth curls. But, like anything, they can be abused or over used! Sadly, we see this all too often. That’s why we put together our 6 top flat iron mistakes and how you can avoid them. And yes, please post this list wherever you style your hair! 1. Cranking up the heat-And we mean, all the way! You don’t need 450 degrees, ladies. Generally, 410 works for every hair type. A flat iron that’s too hot is a prescription for fried, split hair. Ask us about the best temperature for your hair type and then stick with it! 2. 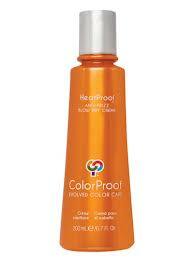 Forgetting protection-A thermal protectant like Heat Proof thermal Protectant is a must when using a flat iron. It’s a lot like shoes and socks; they work together. 3. Flat ironing curls over and over again. Get your hair as straight as possible BEFORE ironing by stretching out each section with a brush. Then s-l-o-w-l-y and steadily go over that section in a single pass. Don’t stop and go. That’s how you create horizontal lines. 4. Making your hairstyle board straight. Instead of ironing your hair parallel to your face, try this. Move your arm in a C shape as you proceed down the hair, bending the ends under. It’s a beautiful look! 5. Ironing damp hair. This one gives us the shivers. If you hear a sizzling sound and you see steam…well, you’ve just fried your hair. Make sure your hair is dry before flat ironing. 6. Bigger is not always better. At least not with flat irons. Hulking irons make it hard to get to the hairline where hair is curliest. Use a straightener with ceramic or tourmaline plates that are just an inch wide. ← Hair Salons near Columbia Md. – Vivid Salon & Day Spa Hair Tips How to Fatten up Fine Strands!